Yes! I did it! I finally made something for Yuki that she really likes! I have to admit, I’m pretty psyched about this project. A couple of months ago I saw a little toddler wearing a tunic that was similar and definitely had an “I can make that!” moment. Well the idea has been rolling around in my head since then and I just needed the time to do it. Isn’t that what KCW is all about!? 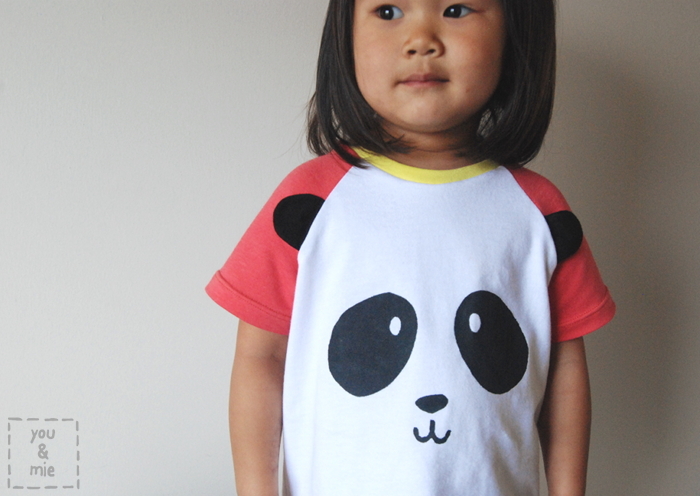 Yuki says, “Can you see my panda ears?” The 3D ears are definitely the most fun feature of these shirts. 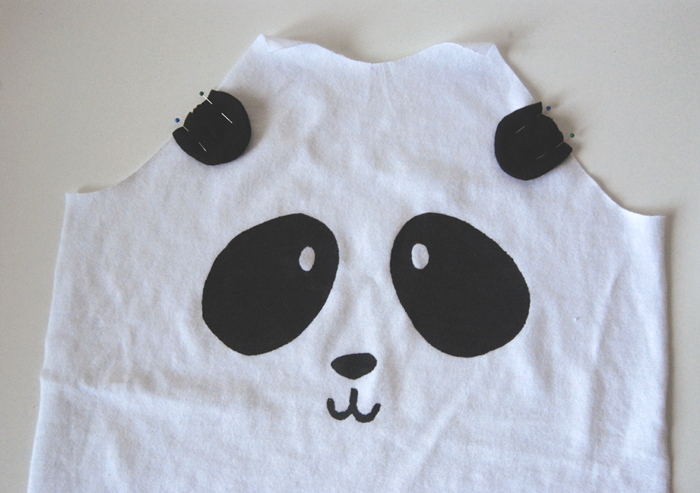 And though these are pandas, you can really make this shirt into almost any animal! 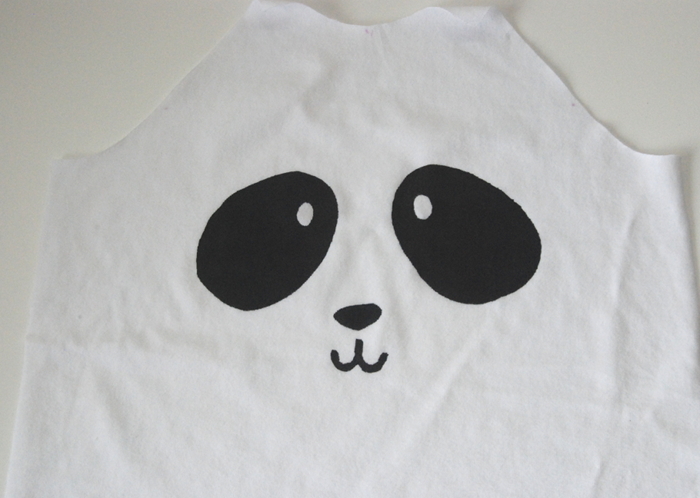 Want to make one for your favorite animal lover? I made a tutorial! 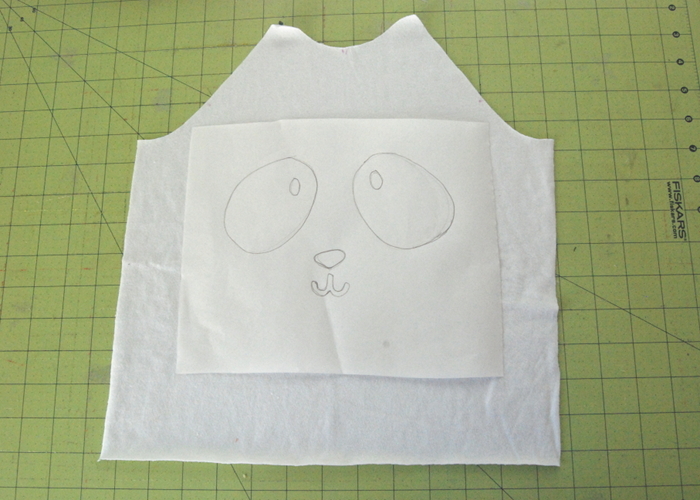 To get started, cut out all your shirt pieces as your pattern directs (shirt front, back, two sleeves and a neckband). Lay out the front shirt piece and place your freezer paper on top, shiny side down. Sketch your animal face. 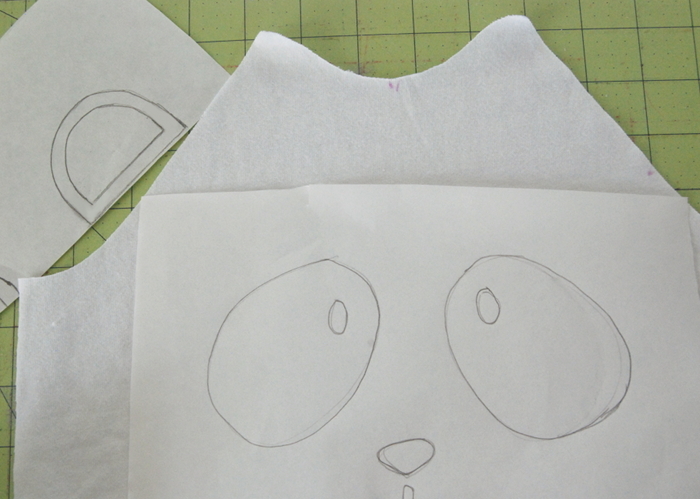 Make a pattern piece for the ears. 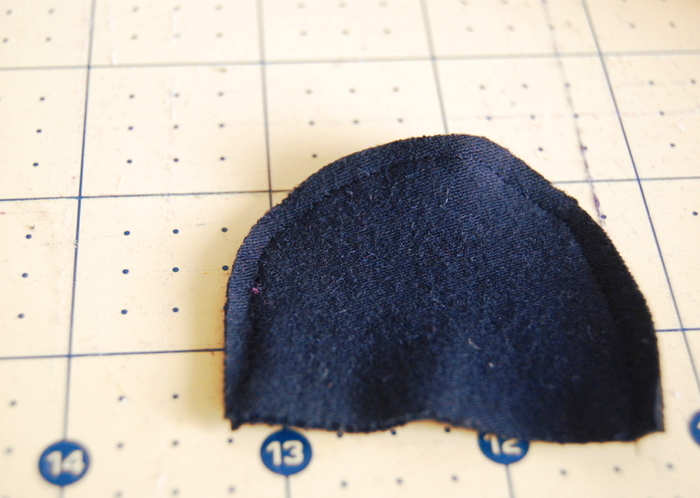 We will add a small pleat to the ear, so add a little width to the base and also 1/4 around for seam allowance. 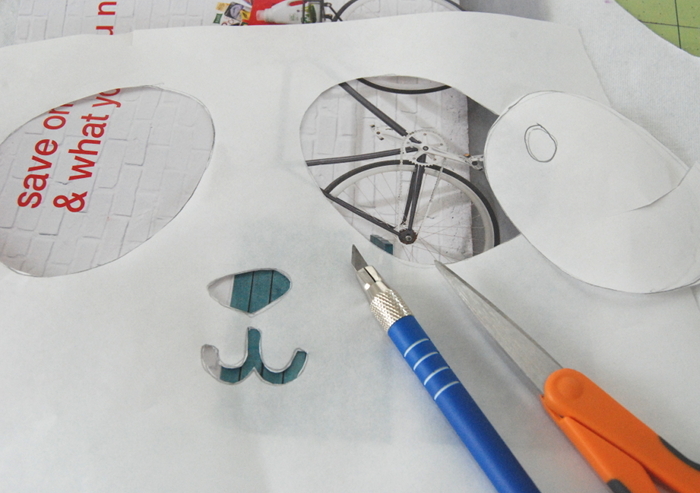 Carefully cut out your stencil, making sure to keep any small pieces you need to place on the inside of your stencil, like the eyes. 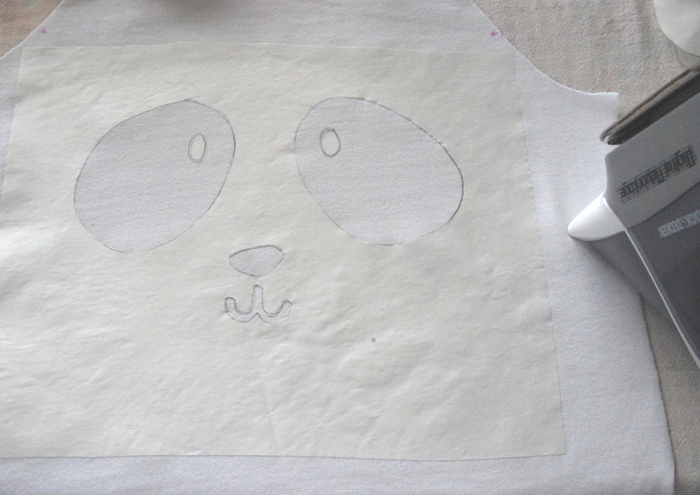 Place your stencil where you want on the shirt (shiny side down) and iron it on using a high heat setting. Be sure to press well especially around the edges of the design. Put your fabric on cardboard or paper, in case the paint seeps through. 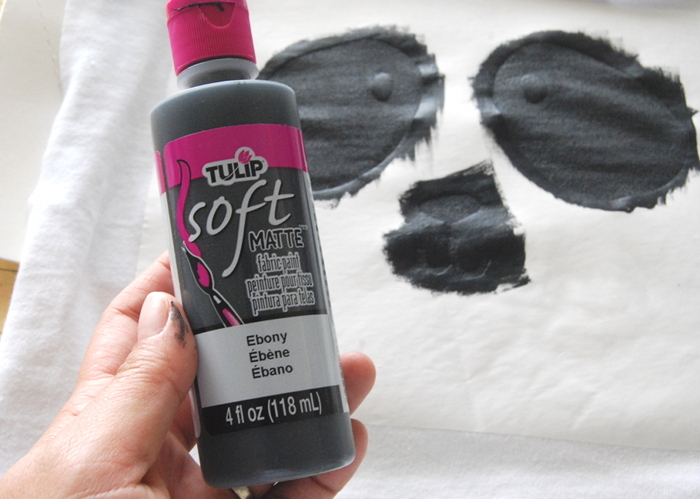 Apply the fabric paint in a thin and even coat. Try not to paint towards the edges of the stencil to avoid sweeping paint under the stencil. Wait till the paint is mostly dry (30 minutes) and apply another thin and even coat. Allow the paint to dry completely before peeling off the stencil. Now for the sewing part. Cut out 4 ear pieces. Place two ear pieces right sides together and pin. Repeat for other pair. 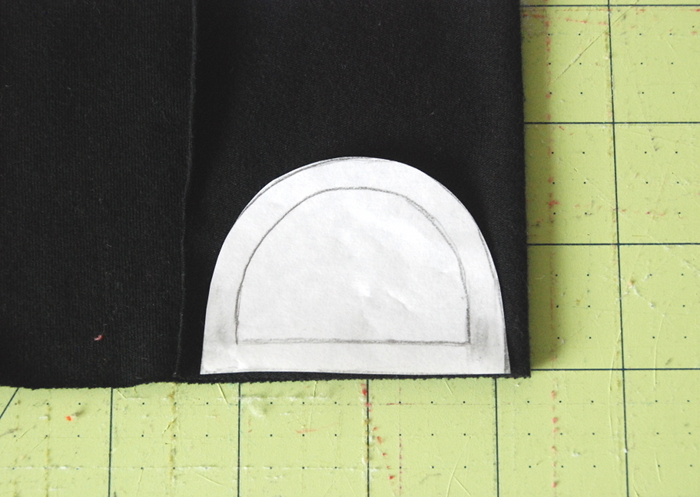 Sew along the curved edges with a 1/4 inch seam allowance. Leave the bottom open. Trim the curved edge to 1/8 inch. Turn right side out and press. 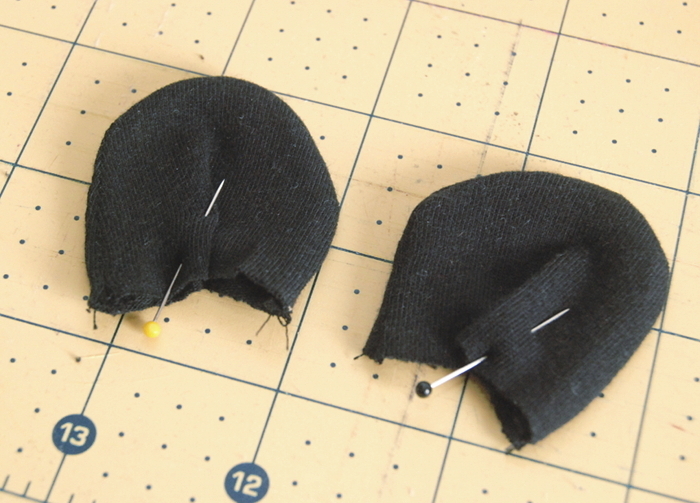 Add a small pleat to the center of the ear (the two ears should have pleats going the opposite direction). Pin and sew pleat in place. Trim the bottom edge so it is straight again. 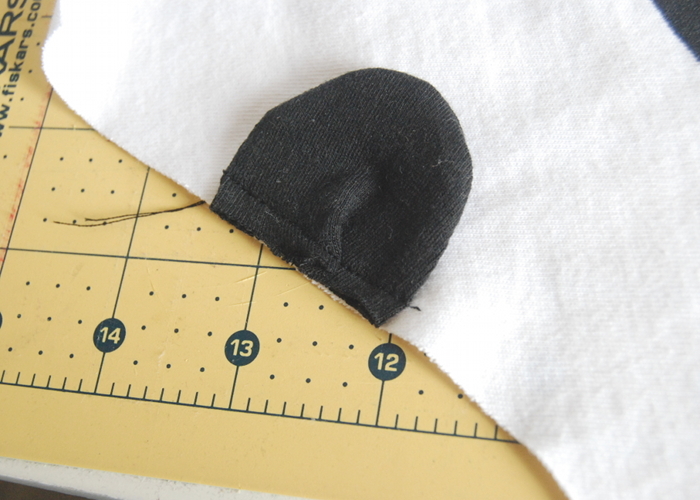 Figure out where you want your ear on the shirt front and align the raw edges, right sides together. Pin and baste the ear in place 1/8 inch from the edge). Now we will attach the sleeve to the shirt front. 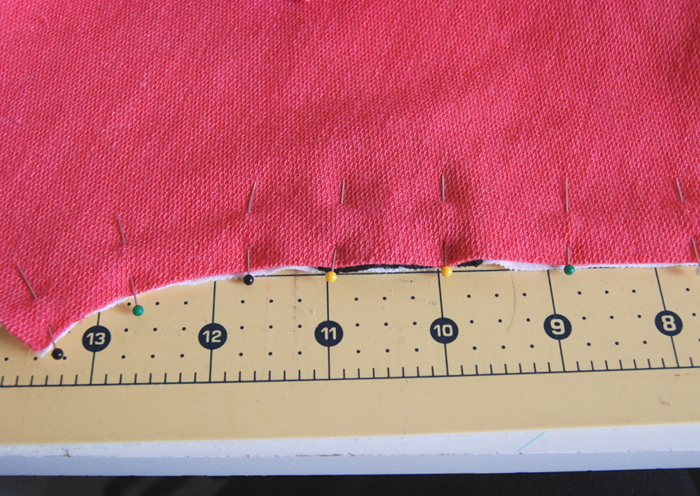 Align the raw edges of the shirt front and the sleeve front, right sides together. The ear should be sandwiched in between. 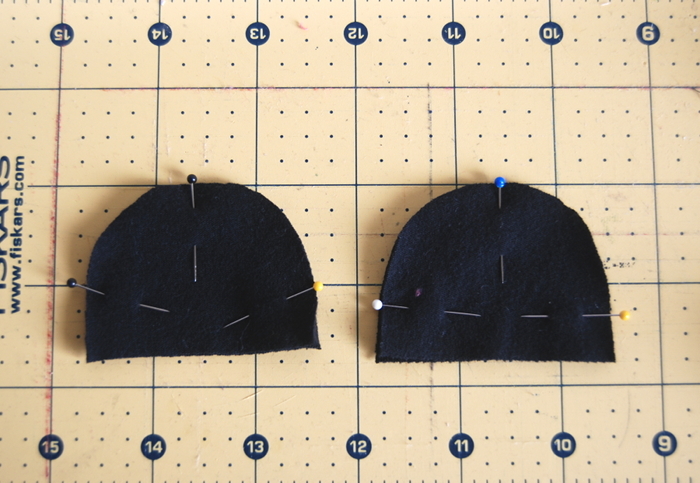 Pin and sew according to the pattern directions. Finish edge if desired. 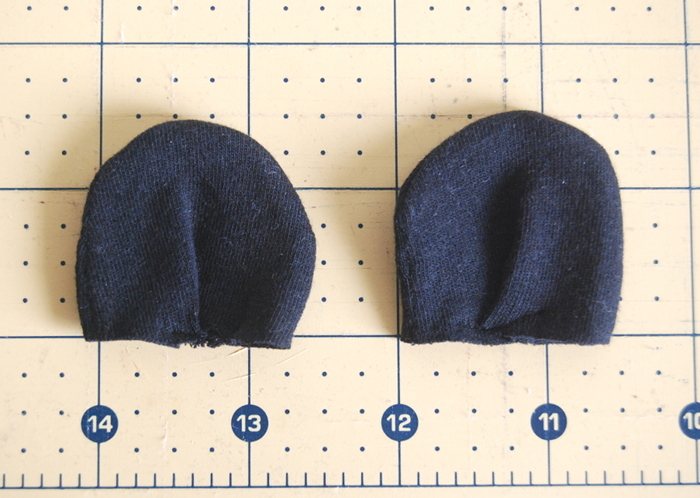 Press the seam allowance towards the shirt and the ear pointing “up” towards the sleeve. 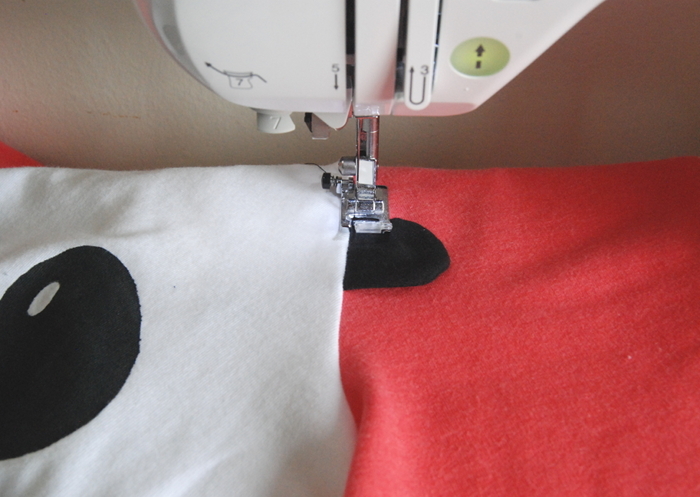 On the right side of the shirt, top stitch the ear to the sleeve close to the seam. Repeat on the other side with the second ear. 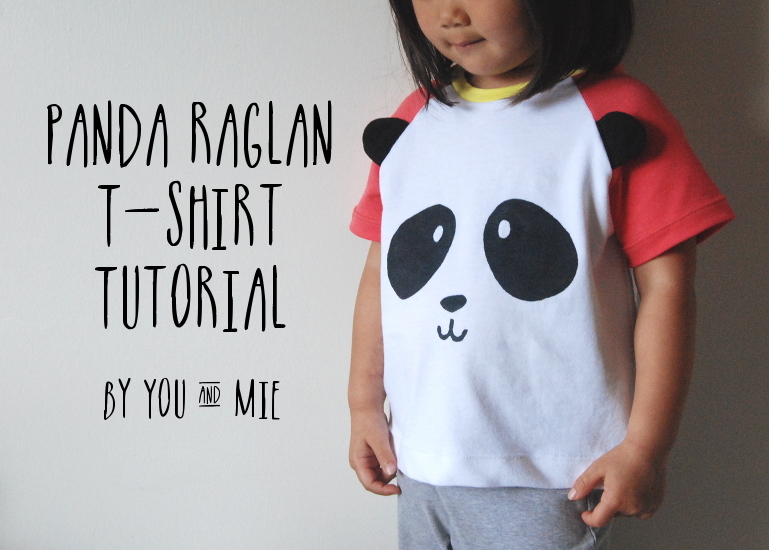 Now finish the shirt as directed in your pattern and voila! 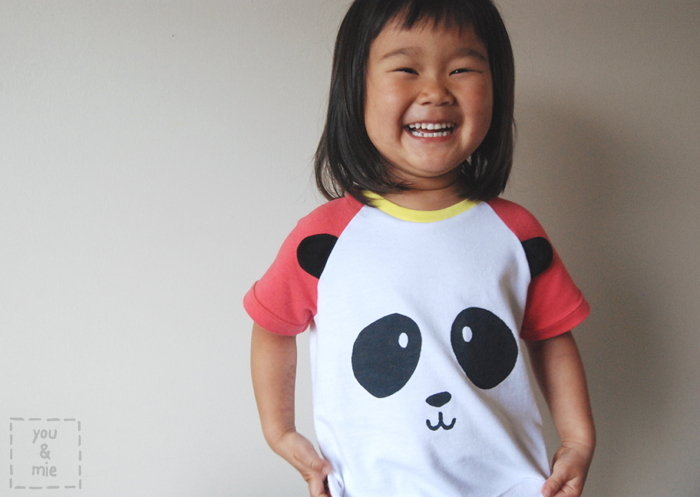 An awesome panda shirt for your little one! Trust me, I reeeeeally think they’ll like it! It was so great to just make something fun, not for a specific project. Thanks for the motivation Kid’s Clothes Week! Hope you’ve been able to make something fun too! 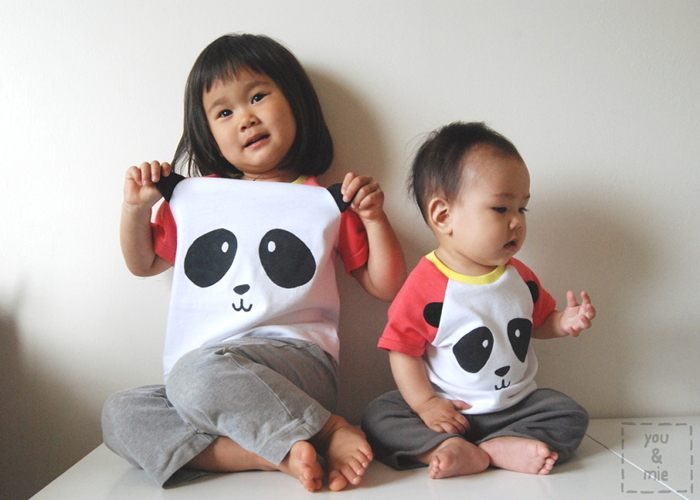 This entry was posted in tutorials and tagged oliver + s, panda shirt, raglan, tutorial by Cherie. Bookmark the permalink. Sono cute!!! Thanks for sharing! super cute! i might make one for myself! 🙂 great job! I think it’s one of the loveliest things I’ve ever seen. I want to make one too! Double the cute! I can’t stand it. These are awesome. I think my daughter would like one for every animal! I might have to start with a cat. Thanks for the tutorial. the cuteness! WOW! I love these tops!! 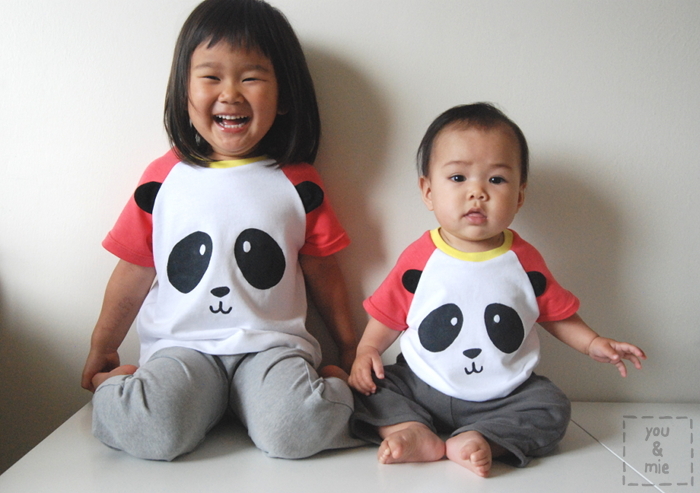 Mie, these panda shirts are the most adorable thing I’ve seen in a long time! And so simple to make! Love that photo of the girls sitting side by side. My daughter would say they are “twinsies”! These are just too cute! Irresistibly so! This is inspired, Cherie! Great job! So adorable!! 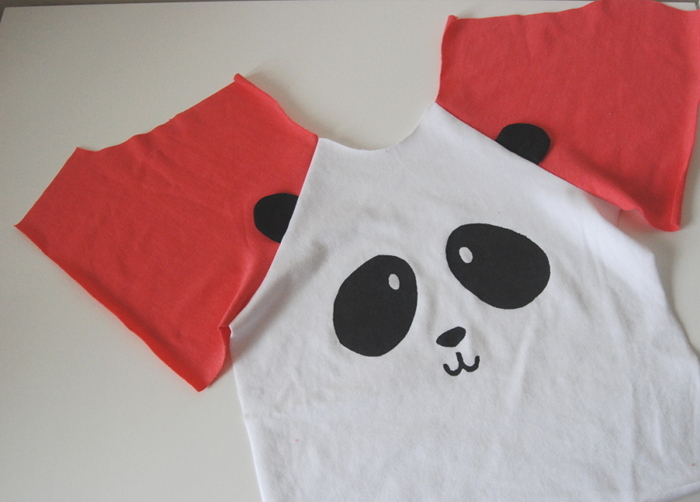 What a great way to fancy up a basic raglan. I need to make one for my girl!! Love this idea Cherie! Absolutely adorable!!! What a cute idea! Holy smokes this is the cutest thing ever. Yuki does look absolutely delighted! the mini version for Kaya is just so sweet. Aww so cute!! You even dressed them alike 🙂 They are adorable! Yay! Thanks everyone! It was definitely an exciting moment for them to come out exactly the way I had pictured in my head (doesn’t always happen, ya know?) AND for Yuki to be so excited about them. Hope you guys make some too!! Awwwww, this ist so sweet =) If I’ll ever be an auntie or mother or godmother or…. I’ll make this shirt!! !